Depending on your age and level of experience in the business world, you might recall the old days of technology when setting up a server in your office to handle email and document storage was something you’d pay a lot of money for. And then you’d pay for a service contract for those times when your server crashed and everything went with it. Not so long ago, every small business had a server in a back room handling everything, along with expensive software licenses for things like Outlook and Exchange, Office and other productivity applications. Today? Forget it: You don’t need anything like it any more. Your small business doesn’t even need the relatively inexpensive desktop and laptop computers for your staff any more. A combination of Cloud Services and “dumb terminals” like the Chrome-book mean you can outfit your whole staff with the latest computing power cheaply and without any significant hardware investment at all. The Cloud is here, friends, and it’s perfect for businesses of all sizes. A few years ago any serious office needed Microsoft Office to function, and those licenses were not cheap. Ask yourself if that’s really true for you today, though. Yes, some businesses have complex templates and macro-based applications developed for Office, and as a result may be tied down to the software at least for the moment. But if you use productivity software mainly for simple word processing, presentation, and spreadsheet uses, you simply don’t need Microsoft Office. Use a free alternative like Libre Office instead – or, better yet, use Google Docs. Cloud-based, with just enough features for basic use, and 100% shareable. No installations to maintain, no license fees to pay, and your employees can access and work on collaborative documents from anywhere, at any time, with full version control and comment tools. Why pay money for a file server when you can just store everything in the cloud – and why pay for the horsepower of a desktop or laptop computer when you can buy a Chromebook for much less money? Chromebooks are essentially dumb terminals, meaning they don’t have much memory, storage space, or pre-installed software. They are designed to connect to Cloud services and run applications that way. As a result, they are lightweight and very cheap, but offer the same power and productivity as a traditional laptop or desktop computer. However, one huge advantage aside from price is that Chrome-books don’t go out of date in the same way. We all know that shortly after buying our employees new computers they begin to complain about slow performance, hard drives filling up, and inability to upgrade to the newest versions of software. With a Chrome-book or similar dumb device, none of that is an issue: Your Cloud is its hard drive, and The Cloud is also its software. When you upgrade a tool in The Cloud it automatically upgrades for all of your employees. The Cloud is here. It’s not perfect – but then the current way of doing things isn’t perfect either. 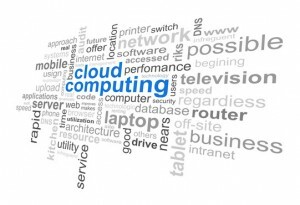 What the Cloud is, however, is cheaper and just as powerful. If the time has come to upgrade your IT equipment, take a long look at a transition to Cloud services instead. Chances are the numbers will make sense. About the author: Ross is an online writer who works with Glasgoweb, a digital marketing and web design agency in Glasgow, Scotland. Ross can regularly be found writing content about small businesses, SEO & PPC. Thank you for this overview. It’s amazing to look back and see how technology has advanced in just a few short years. I remember when Microsoft Word was an absolute necessity. Later, it was great to have the open source programs that were a compelling equivalent; Open Office was my favorite. I still use it to this day. I agree that these days the Cloud can replace so much that was once our responsibility to purchase, and maintain. Google Drive is extremely useful in enabling workers in remote locations to work together on projects and tasks. I’ve used it in such setting in collaboration with others. With cloud services I believe we must not overlook the need to secure the data. Ideally, data should be encrypted. There are some great programs that can do this easily such as TrueCrypt. Great insight! I am a fan of Cloud services personally. When working remotely with team members that are all in different locations – document sharing is critical to successful projects. I have used both Google docs and it is very user friendly. I think that as society gets better acquainted with newer technology the ease of doing business increases. It is exciting to see the opportunities that arise with each new option available. First people were not ready to listen, leave alone understand, then they started to experiment and later adapt. It is still a growing trend and options are immeasurable. No wonder Microsoft, Google, Oracle and all the tech companies are investing heavily in this area. I’m a big user of cloud services. I use the Mozy premium service to backup my documents, photos and videos from my laptop. Amazon has a cloud service that I use for my ebooks and PDF files. Plus I use Dropbox for sharing files with my clients. The only thing I will suggest is if you’re adding sensitive information to a cloud service like Dropbox, you should encrypt it with something like AxCrypt. AxCrypt is an open source program (for Windows users) that keeps your cloud stored files safe from potentially prying eyes. It’s really easy to use. Just right click on your document in Windows Explorer and choose to encrypt the document with AxCrypt. Once it’s encrypted you can upload the file to the cloud and know that if it ever gets exposed, it’s still safe. Plus, did I mention it’s free? Thanks for the tips! I had not tried Dropbox yet, but that is something I am going to do. Yes, I agree on all points. Although I primarily use Google Drive and Google Docs for collaborative work, I find that Dropbox is very handy and easy for passing work back and forth. It’s well-named, I think, as it really does function like a drop-off box! I also agree on the encryption. Both AxCrypt and TrueCrypt are free programs and they are not intimidating. Even the word “encryption” somehow sounds intimidating, as if you have to be some sort of mastermind programmer to be able to do this. But like much that we take for granted on the Internet yet could not for the life of us explain how it works — how does a “browser” really browse the Web? — same with encryption. While the “cloud” seems airy and out there somehow, the technology is so very accessible and it’s a vital resource, in my view, for safekeeping and for sharing. I’m sorry, I’m a little behind. What is the cloud and what exactly does it do for companies? Can anyone use it? I plan on opening an e-commerce website, how can it benefit my company?